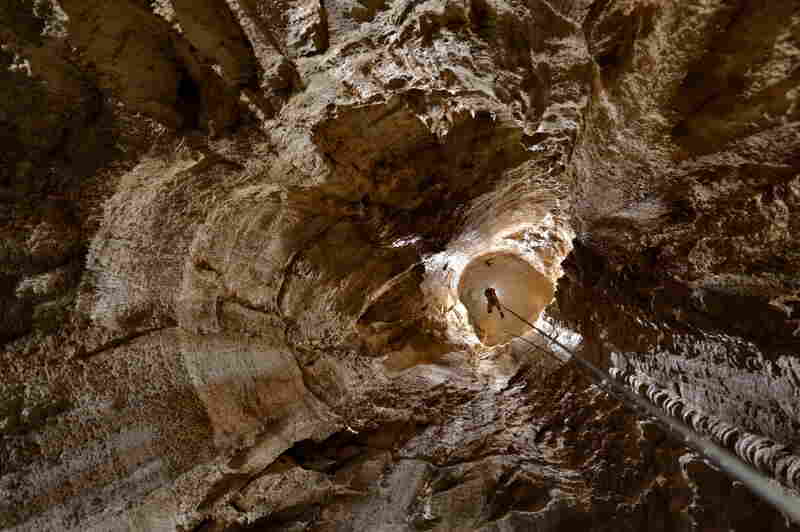 Illuminating The Underworld In A Deep, Dark French Cave : The Picture Show The Gouffre Berger cave in France was once dubbed the world's deadliest. 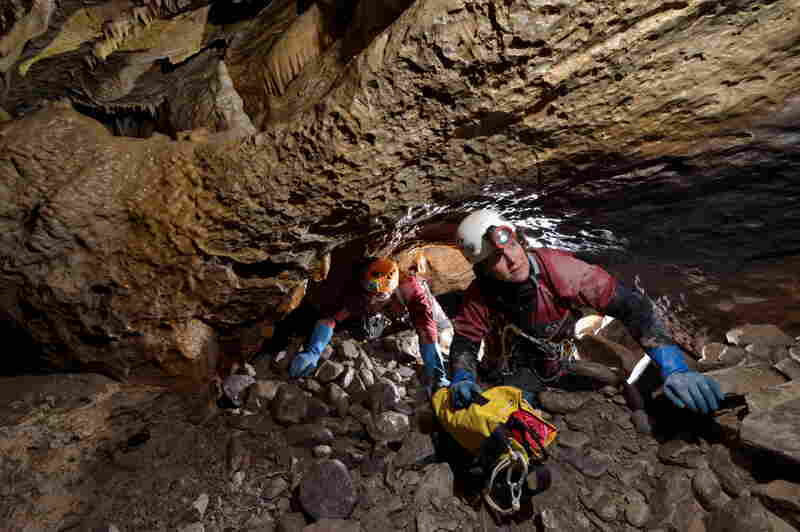 Now it's a rite of passage for new cavers. Photographer Robbie Shone illuminates its dark, and cold, depths. Looking down Puits Garby at caver Adam Spillane. 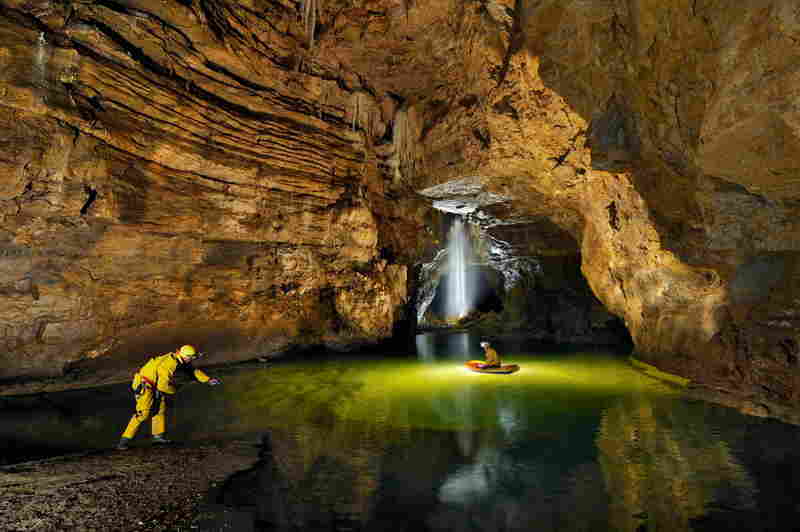 Cavers cross Lake Cadoux in a small dingy inside the Gouffre Berger cave. A 4-meter-deep (approximately 13 feet) pool of water blocks the way forward through the Starless River. James Alker swims through the Pseudo Siphon at a depth of 1,118 meters (about 1,223 yards). With a water temperature of below 4 degrees Celsius (39.2 F), the long swim through the narrow canal chills the body through to the bone. Tim Nixon tries to warm up using the heat from a candle. 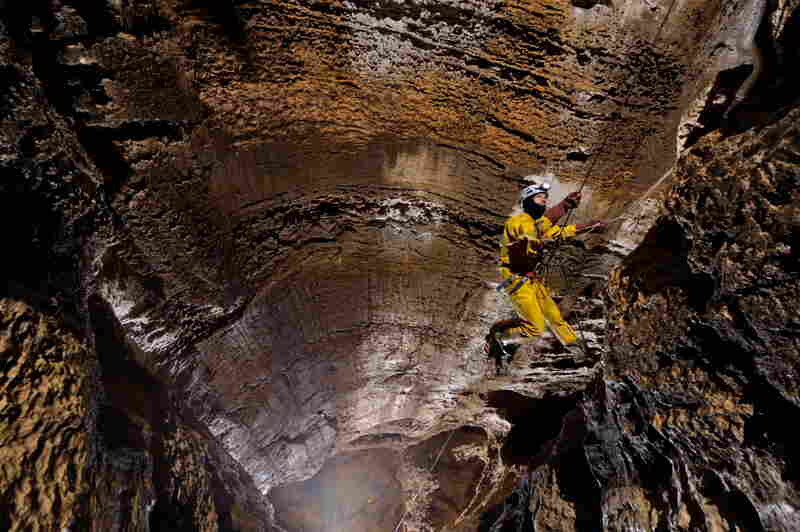 The temperature in the cave constantly hovers around 4 degrees Celsius (39.2 F). 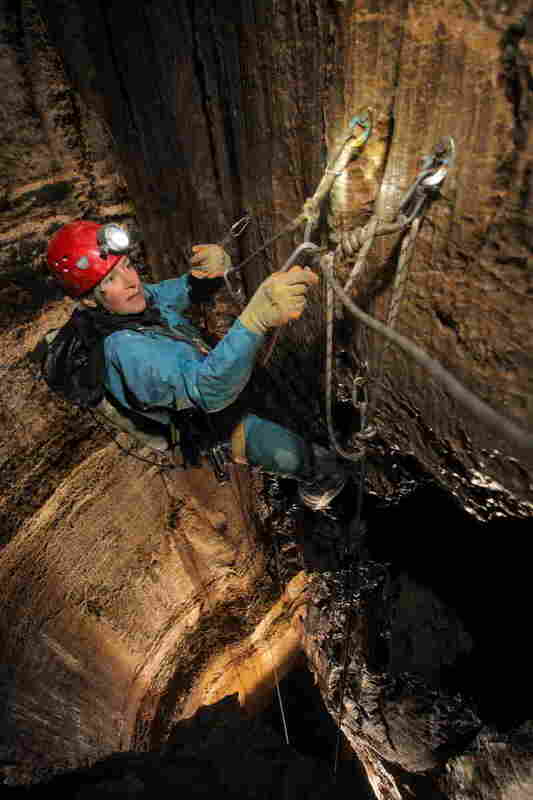 Cavers crawl through a 10-meter-long (about 33 feet) section of the cave. Matthieu Thomas and Sophie Anne pose for a photograph in the Hall of the Thirteen a few days after Matthieu proposed to her at the bottom of the Gouffre Berger cave. Sarah Payne tackles the rope traverse at the head of a section called Puit Aldo. Chris Blakeley passes the deviation in Puit Aldo. Looking up The Great Rubble Heap in the Gouffre Berger. Looking into the main entrance of the Gouffre Berger. 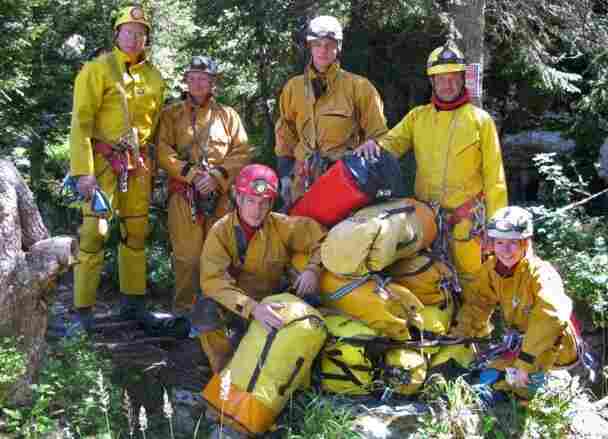 In recent years there have been six deaths in the cave, five due to water. 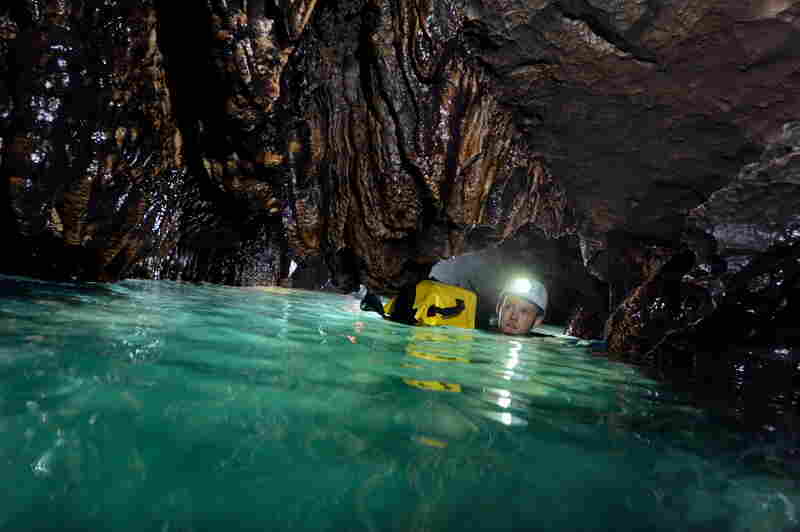 During a storm or heavy rain, the cave can become a dangerous trap when water levels rise rapidly. 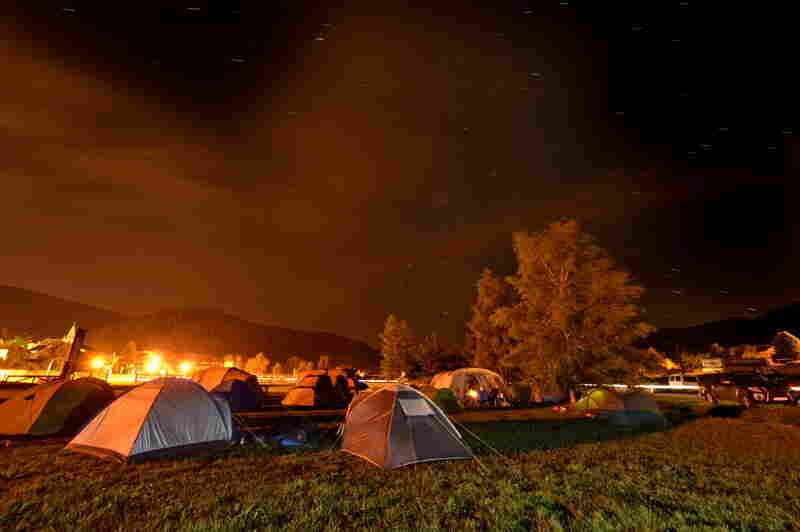 A starlit sky descends upon the campsite in the small village of Autrans, France, where the expedition prepares to descend the Gouffre Berger. 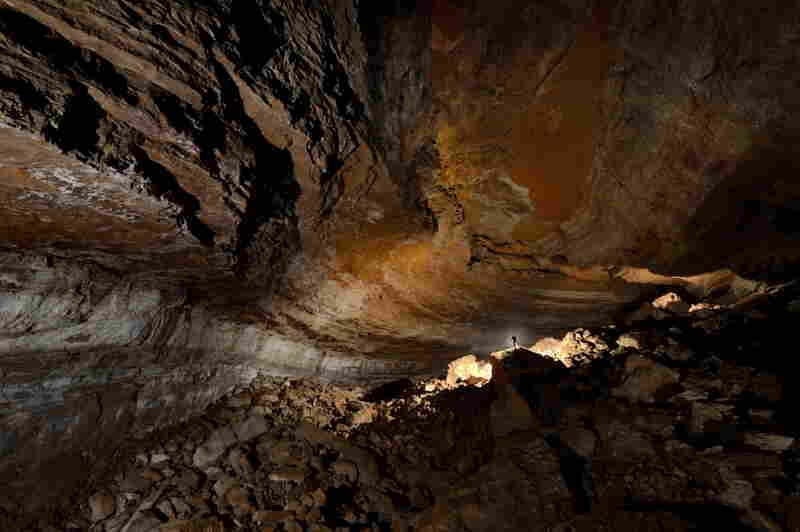 Photographer Robbie Shone used a lot of flashbulbs while photographing the famous French cave Gouffre Berger. A lot of flashbulbs — more than 600 in four trips. To get an idea of the challenge of photographing inside a pitch black space, imagine firing your flash at a subject in a dark room. The result might look something like this. The foreground is harshly lit, while the background stays dark. 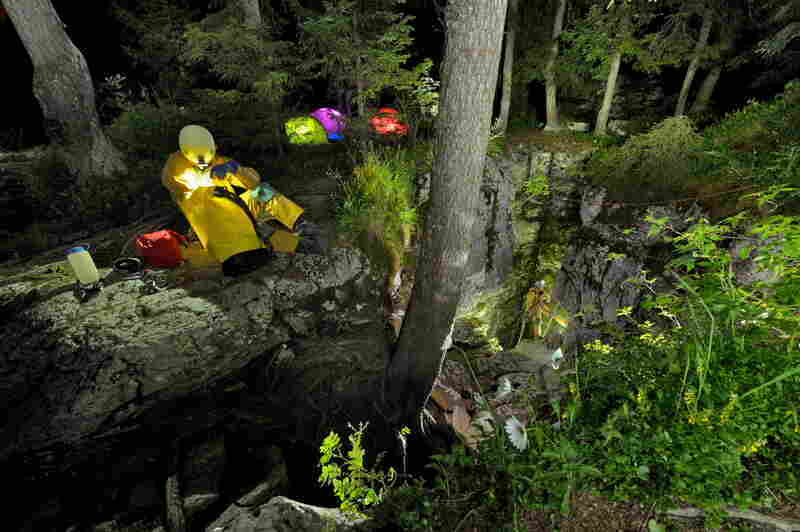 To get the glowing, painterly look of his underground photos, Shone needed a team of assistants, as well as a variety of LED headlamps, electric flashguns, and old press flashbulbs. He set them up in an array, then used a trigger to fire the lights remotely — illuminating the cavernous space from multiple angles. "Big rooms underground require a lot of light, and placing [them] is the most important and skilled part of the photograph, as this depicts how the walls and space comes alive," Shone told me, via email. In addition to the lighting challenge, the team worked at a near constant temperature of 39 F, while carrying full camping and caving gear. 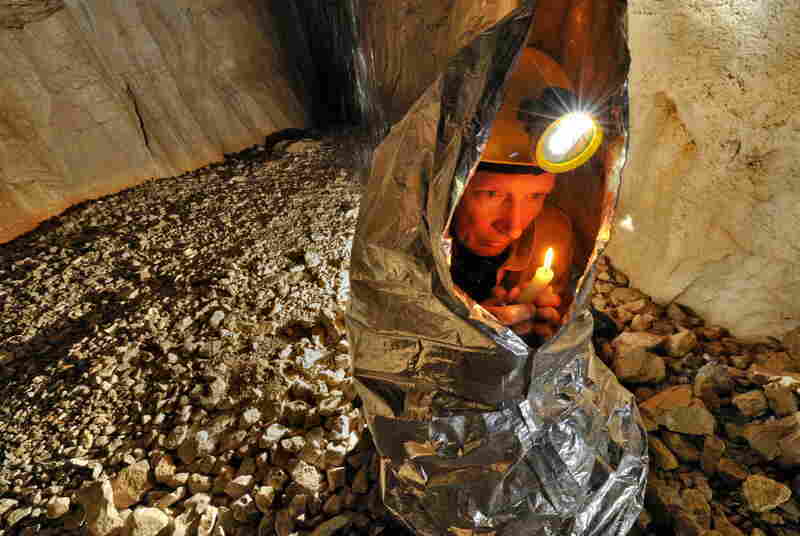 On his recent trip, two nights were spent underground in the Salle des Treize (Hall of the Thirteen), which included a 17-hour trip to the bottom of the cave. The purpose of that exhausting sojourn was to make six photographs. Photographer Robbie Shone (front, red helmet) is seen with his team at the Gouffre Berger in 2010. Also pictured from left: Tim Nixon, Bob Toogood, Mark Richardson, Mark Wright and Gina Moseley. Shone is a travel and adventure photographer who has worked all over the world. Over the past few years he made multiple trips into the Gouffre Berger to create photos for a coffee-table/rigging guidebook that will also include a history of its exploration and a complete topographic guide. All the proceeds will go toward caving grant foundations. I asked him if he ever got scared in the cave. "Very rarely scared, always excited, he said. "From the moment you enter a cave and leave the daylight and the comforts of the surface behind, all senses are alerted and magnified. 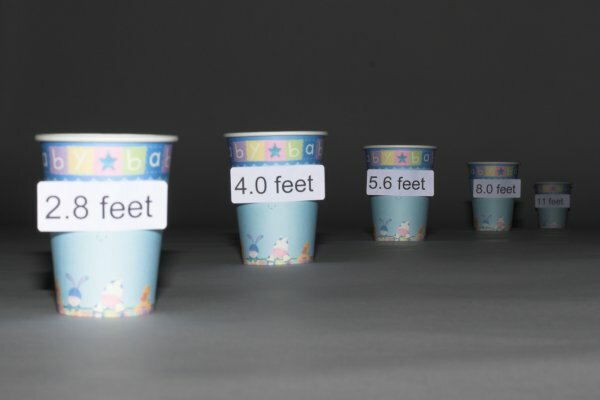 You spend the entire time concentrating on where you are stepping. You rarely switch off." 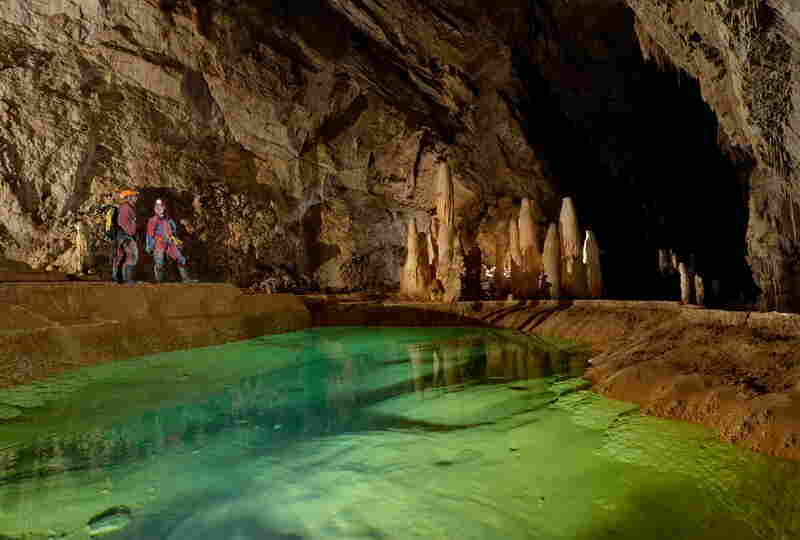 The cave was named for Joseph Berger, who discovered it in 1953. It was originally thought to be the deepest in the world but has since been demoted to 28th. 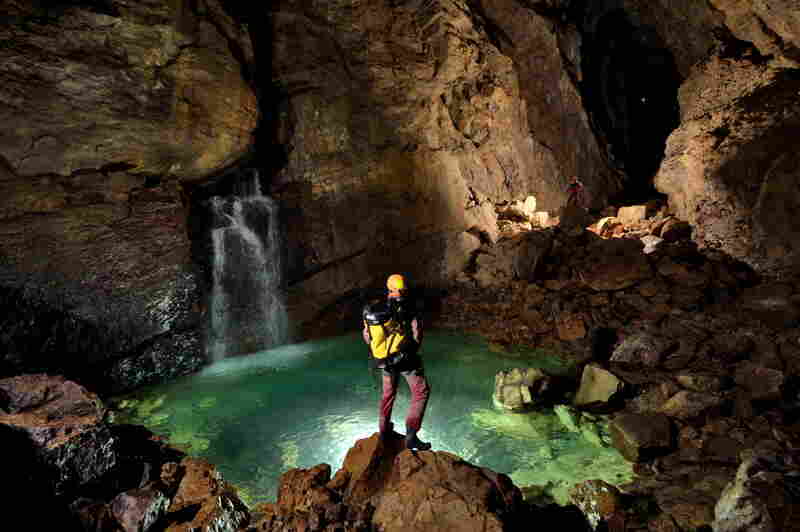 Still, it is regarded as a "must-do" for cavers around the globe.